Established in 1995 Mother Dental Implant Clinic is a six operatory (dental chairs & units) setup complete with Digital OPG, fully air-conditioned, luxuriously built on the ground floor on main road in an area of three thousand square feet with a parking facility. We are located in Darya Ganj, New Delhi. Well connected to all the areas of the city by various means of transports. In the very near vicinity of the clinic, are located many budget and star hotels and old and new shopping areas and places of historic interest. English is well understood by most people of the city, as are all the sign boards in English. Facility for banking and authorized foreign exchange money changer is available next door to the clinic. Mother Dental Implant Clinic offers all dental treatments and very strictly adheres to international guidelines of infection control procedures. All instruments that are used in the treatment are either disposable or thoroughly sterilized. All the dental materials that are used such as implants, filling materials, composites, ceramics etc. are the world’s best brands. Each patient is given personal attention by the treating doctor. 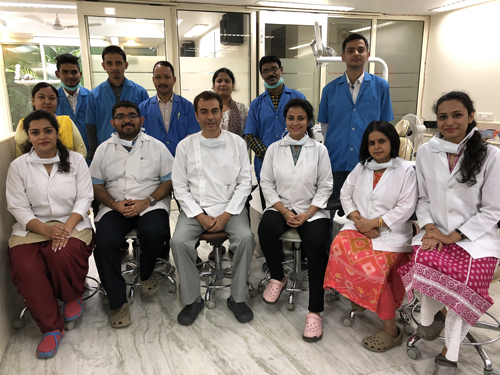 The team of specialist, general dentists and assistants is headed by Dr. Mahesh Chauhan, BDS, Certificates in Implants and Prosthetics, Ohio, USA who is a leading Dental Surgeon of India. Dr. Chauhan was formerly Adjunct Assistant Professor at the Ohio State University, School of Dentistry, Columbus, Ohio, USA. All the laboratory work is done by a dentist and her team of certified dental technicians, who is experienced in dental laboratory work for more than fifteen years. Complete patient satisfaction is our passion at Mother Dental Implant Clinic.